Celebrity Extra: Interview: Beau Mirchoff Is Feeling Awkward. Interview: Beau Mirchoff Is Feeling Awkward. Many fans will remember Beau Mirchoff from his year-long stint on “Desperate Housewives” during the 2009-10 season, where he played Drea de Matteo’s son, Danny. Nowadays, he plays a character who gets himself into cringe-worthy situations, and while they are not quite the life-or-death situations his character on “Housewives” got into, to many teens, it might seem so. Beau plays Matty on the new MTV teen comedy series “Awkward.” If you remember your teen years like I remember mine, then you know everything is a big deal in high school. Beau takes me through these awkward times and spills the beans about this new project, which airs on MTV Tuesday nights at 11/10c. Celebrity Extra: As someone in my 30s, I wasn’t expecting to like “Awkward” as much as I do, but I have to tell you, I absolutely love it! It’s smart, funny, well written and well acted. 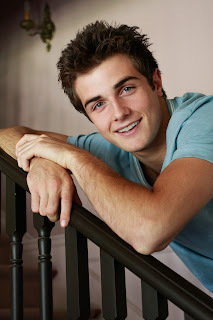 Beau Mirchoff: I think so too. I think there are diverse characters and that people of all ages can relate to the situation and to the characters. It’s a show about teenagers, but I think there is a little bit of everything for everyone. My mom is in her 50s, and I guarantee you this will be her new favorite show. I’m glad to be on something that people are really talking about. CE: Tell me about your character, Matty, and the things about him that appealed to you as an actor. BM: The characteristics that appeal to me are he’s lovable and he’s loving. Matty’s thing is, he wants to be perfect; he wants his family to be perfect, and he doesn’t want anything to look negatively on his family. He constantly wants to be liked and to please people. And does he do that in the wrong way sometimes? Yes, of course. I think most teenagers don’t have a clue how to handle most situations. They might think they do, but they don’t. CE: While this is told from a girl’s point of view, the writers do a great job of showing how being a teen, whether girl or boy, is just plain difficult. BM: I think they are often very similar, emotionally. Guys put on the façade that everything is cool, but deep down I think they have some of the similar problems with image, popularity and fitting in — finding a girl and being loved and all those types of problems. CE: This seems like it would be a fun set to work on. BM: It was awesome; it was fun; it was happy! Everyone was great and supportive. We always would run lines and talk about our scenes and our characters, trying to find new things in scenes that we hadn’t found before. We’d come up with new, creative ideas and run them by Lauren (Iungerich, executive producer/creator/writer). Every once in a while, I’d come up with a really good idea and it would work. Life on the set was creative and fun. CE: Another fun and creative set you worked on was with the folks at “Desperate Housewives.” What was that experience like? BM: Educational. I learned so much from all the people on that set with all those actors and actresses. They are pros and they know what they’re doing. I was very grateful to get that job. Not just for the recognition and whatnot, but to grow as an actor. You can only learn so much in acting class, but when you’re on set, it’s a whole different thing. I learned a lot from Jeffrey Nordling, who played my father, and Drea de Matteo, who was my mother. A majority of my scenes were with them. You learn a lot from just watching them work, and you see how they do it. That was what was most beneficial from that. CE: I am a big “Sopranos” fan, and was so happy to see Drea on the show. How cool was it that she played your mom? BM: Yeah, I had a big crush on Drea. I hope it didn’t read on camera. That would have been creepy, since she was my mom, but it probably came out. It’s inevitable. She’s quite attractive and so great at what she does.